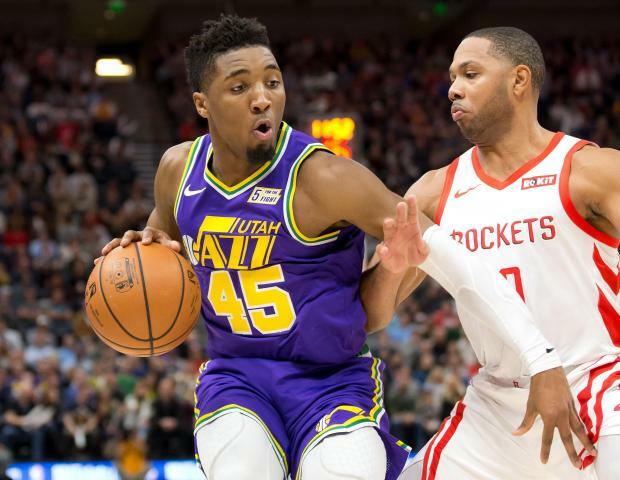 Derrick Favors recorded a double-double off the bench, and Joe Ingles helped shoulder the early load on offense as the Utah Jazz continued their strong play with a 118-91 demolition of the Houston Rockets on Thursday in Salt Lake City. Favors finished with 24 points and 10 rebounds in just 25 minutes while Ingles totaled 18 points on 6-of-9 shooting. Utah has won five of its past seven games while Houston has dropped six of its past eight. The Jazz lost starting center Rudy Gobert to an ejection at the 9:13 mark of the first quarter and received only six points from Donovan Mitchell yet coasted to victory against the listless Rockets, leading by as many as 37 points. James Harden paced the Rockets with 15 points but shot 5 of 16 from the floor and recorded seven turnovers. Chris Paul had five turnovers and five assists to go along with his 12 points, and Clint Capela added 12 points and 10 rebounds for the Rockets. Kyrie Irving collected 22 points and eight assists as host Boston placed seven in double figures and recorded a wire-to-wire victory over New York to extend its winning streak to four games. Irving recorded his 15th game with at least 20 points and led Boston in scoring for the 13th time. His showing helped the Celtics win for the fifth time in six games since a 117-109 home loss to New York on Nov. 21 in a game Boston trailed by 26 at one point. Boston's Jaylen Brown added a season-best 21 and shot 7 of 10 after sitting out the previous three games with a back injury. Al Horford added 19 points and a season-high 12 rebounds for the Celtics. Tim Hardaway Jr. scored 22 points for the Knicks. Damian Lillard scored 25 points and dished out eight assists despite sitting out the entire fourth quarter as Portland rolled past visiting Phoenix. Jake Layman came off the bench to score a career-high 24 points on 10-for-13 shooting and grab seven rebounds for the Trail Blazers, who snapped a three-game losing streak. Troy Daniels scored 15 points for Phoenix, which has lost seven in a row. Josh Jackson had 14 points, and Deandre Ayton added 11 points and eight boards for the Suns.